Being a long-time user of Neopets I have had my fair share of experiences on the site. Some great, and others not so great. But no matter what was happening I was along for the ride... and so here I am, sharing my top ten favorite personal Neopets memories with all of you! When I first started on Neopets I was obsessed with Slorgs. I thought they were the cutest things I had ever seen, and I wanted as many as I could get my hands on. While the Slorg itself was (and still is) a relatively cheap Petpet, I set my eye on something better: an Island Slorg. I stalked the Trading Post for quite sometime before I ever made an attempt at trading with someone, but I saw a user who wanted 35,000 neopoints for an Island Slorg, and I decided this was my chance. I think my account was 4 months old at this time, and by no means did I have 35k- so I decided to neomail the user and try to haggle. They were politely firm, and I was sadly desperate for the pet... but I didn't have what they wanted, so I was out of luck. To this day I still don't have my Island Slorg... but of course I still want one. I love anything Water Faerie themed, and I have a small collection of items in my SDB. A long time ago I bought a Water Faerie eraser from a user shop for about 1,000 neopoints; the item was labeled as retired, but it wasn't in high demand so the price stayed relatively low for years. If you search for it through the Shop Wizard today, you can find it for around 25,000 neopoints... and I feel strangely satisfied knowing about half of the items in my SDB have (immensely) increased in price over the years. My first year of the Advent Calendar was in 2005, and I remember I was so excited for it to begin. I woke up on December first that morning, jumped onto Neopets and clicked "Collect my prize! "...only to be disappointed by the prizes: a handful of humbugs and a Chia clown poster. Over the years I've learned to love and cherish all the Advent Calendar items; they are small pieces of history that many many people hang onto. My favorite Advent Calendar prizes are the food prizes... I'm not sure why, those are just my favorite. When I first started out on Neopets, there was no such thing as an Item Gallery. I remember going into different user shops and seeing all of these beautiful items priced at 100,000 Neopoints, and even though at the time I never thought I could afford something that price, it didn't matter: because those items weren't allowed to be purchased. If a user wanted to show off a particular item they just spent their hard-earned savings on, they would put it in their shop and price it at 100,000 NP. This price made the item unbuyable, therefore putting it on display in the user's shop. Then Neopets added the official Item Gallery- making the highest price in a user's shop 99,999...and forcing me to want to buy and collect things. I saved up so many Neopoints. I wanted the avatar. And even though I knew it was a stretch to save for a Faerie Queen doll, I wanted to buy something- ANYTHING from the Hidden Tower. So I settled for the cheapest thing: Squeezy Tombola Guy at 100,000 neopoints. I bought it, got my avatar and... threw the toy into my SDB (and he hasn't come out since). It was a Speckled Xweetok. I adopted it from the pound (I have actually been very successful in finding painted pets in the pound- that's where I found my Faerie Nimmo), and only had it for a couple months before I put it back into the pound for someone else to love. But after I got a taste for the "painted life" I couldn't get over it, and obsessed over paintbrushes until I found my Faerie Nimmo. 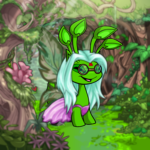 Then a few years later Boochi zapped my Aisha, and a few years after that I got lucky on the lab ray (with my other two pets) and have been content with my pets' colors ever since. Oh man, Neopets, PLEASE bring back this cereal. It was honestly really good, and it came with an exclusive Trading Card (for my obsession with the TCG skip to number 2 on this list). It tasted like berries, and along with the cereal promotion came a new game on Neopets: Caves&Corridors (which is very fun, you should check it out). Ah, I loved everything to do with this cereal... and everyday I think about how much I want a big bowl of Islandberry Crunch. If you don't remember or have never seen the old Neopets site layout, then you're missing out: it was (in a very strange way) amazing. It was just so simple... and... yellow. When TNT first made the official switch to the new layout I honestly hated it (I've grown to really like it now). I didn't understand where anything was anymore... some of the menus were the same, but there was one page in particular I couldn't find: the Pet Central page. I'm not sure why I wanted to find it so badly, but I did, and it literally took me MONTHS before I found where it was. The old layout was so sleek and simple- I missed that. However now I enjoy seeing my active pet right on the page, and having popular pages located in handy drop-down menus at the top of the screen. It was hard to get used to at first, but this is one major site changed I really like. I know, I know this sounds very cliché, but this story is different than most. It doesn't start off with me hearing about the website from a friend, or getting little plush toys in my Happy Meal... because I don't remember how I heard about Neopets. And I think that's what makes this memory so special. Because despite the fact that this website completely changed my life, I don't remember at all how I stumbled upon it... and in a way I think that's kinda cool. My first account on the site opened up a whole new world to me, and very quickly I found out about main and side accounts- and I wanted all of them. I made five accounts in one day, and at this current time I can only remember the username to two of them (the "main" account I created and one of the "side" accounts). One day I got stuck logged in to the side account and couldn't remember my "main" account's information... so I played games and things while waiting for the retrieval email (this was before I knew you weren't allowed to earn Neopoints on your side accounts). But I got lazy, and when the email came I never logged out of my side account, and I made a permanent switch between accounts. So my main account now, WAS my side account and my side account now WAS my main. So not only can I not remember how I was introduced to Neopets, but within the first week of playing I flip-flopped accounts ( I don NOT recommend doing this, by the way)...and even though my beginnings on Neopets were a complete mess, as they say: the rest, is history.